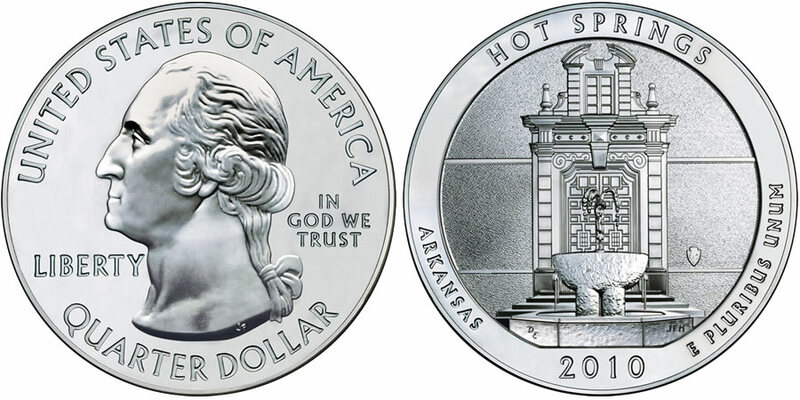 The 2010 Hot Springs Silver Uncirculated Coin serves as the inaugural strike for a series of collectible five ounce silver coins from the United States Mint. This specific strike in the series honors Hot Springs National Park which is located in the state of Arkansas. Coins in the series are struck as part of the Mint's America the Beautiful Five Ounce Uncirculated Coins, which are the numismatic versions of the Mint's America the Beautiful Silver Bullion Coin™ Program. Both programs contain coins struck from five ounces of .999 fine silver. The 2010-dated strikes each feature a diameter of three inches making them the largest bullion products of the Mint. Both series are based on a third program of coins from the US Mint known as the America the Beautiful Quarters® Program. As such, the obverse and reverse designs of all three programs contain similar imagery with reverse designs emblematic of selected sites of national interest from around the United States, including one chosen from each state, the District of Columbia and the five US Territories. This totals fifty-six locations to be honored by the three programs with five struck per year in each series from 2010 until completed in 2021. Unlike the bullion versions of the coin which are sold through the Mint's network of authorized purchasers, these numismatic silver coins will be sold directly to the public by the US Mint. A release date of early 2011 has been indicated by the Mint. 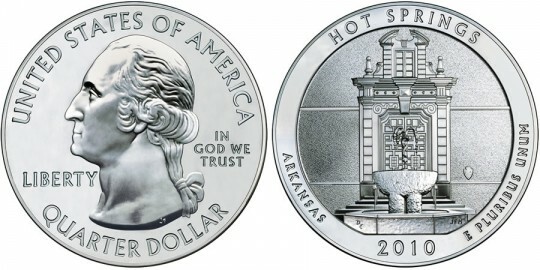 The inscriptions of "UNITED STATES OF AMERICA," " LIBERTY," "IN GOD WE TRUST" and "QUARTER DOLLAR" surround a portrait of George Washington on the obverse of the Hot Springs National Park Five Ounce Silver Uncirculated Coin. The portrait was originally designed by John Flanagan and first used on the 1932 circulating quarter dollar.